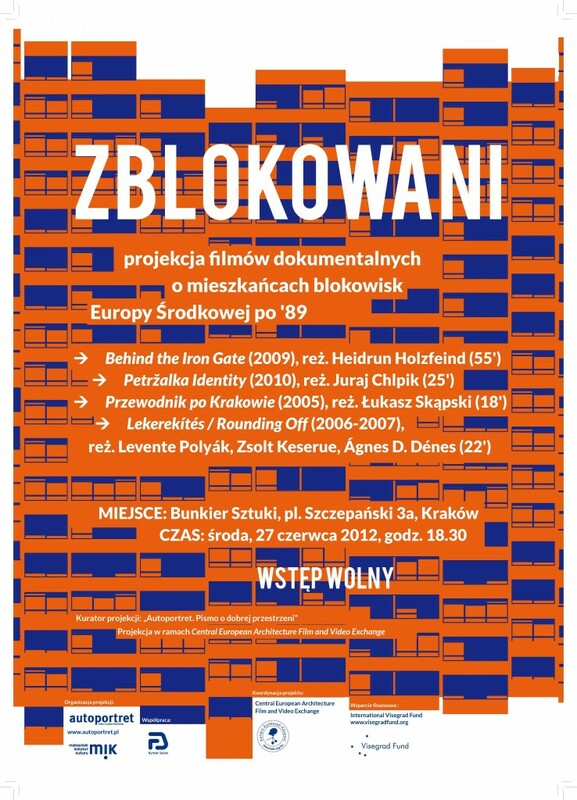 The Malopolski Instytut Kultury and Autoportret, in collaboration with Bunkier Sztuki and the Hungarian Contemporary Architecture Centre, present a selection of documentary films reflecting on the changing attitudes to prefabricated housing estates and apartments. In the decades between the 1960s and 1980s the mushrooming of industrially produced buildings changed the face of cities in Eastern Europe. These buildings were designed for cheap construction and extreme spactial efficiency, leaving little room for unplanned functions and activities. The films selected by Dorota Leśniak-Rychlak and Ola Wojda for Blocked focus on users? ways of inhabiting prefabricated housing estates, not only by adapting to their new living spaces, but also by diverting their logique and domesticating them. The film portrays everyday life in the communist era housing estate Za Zelazna Brama (?Behind the Iron Gate?). The housing estate was built by a team of architects between 1965-1972 in the center of Warsaw on the ruins of the so-called Small Ghetto. The 19 blocks, each 16 floors high, are based on modern rational principles. They were occupied by workers, functionaries, academics and the Warsaw intelligentsia. In the 1970s the housing estate was considered a symbol of Polish socialist prosperity and technological progress. Today the small apartments are regarded by many as substandard and an unpleasant reminder of the communist era. Since 1989 many post-modern apartment buildings, office towers and hotels are being built in between the blocks, destroying green areas and the original lay-out of the housing estate. The short documentary Petržalka Identity is a follow-up to an exhibition of the same name, presented by Juraj Chlpík on Bratislava?s New Bridge in 2006. With its 130,000 inhabitants, Petržalka is the biggest neighborhood in Bratislava. Three generations have grown up here since it was built. People are dying and being born, a new chapter of history is being written, one that is not perceptible from the outside, but only from the inside, from the point of view of our memories and our intimate personal stories. The movie portrays several people living in this featureless world of concrete, trying to find a place for themselves in this jungle of blocks of flats where they could put down roots. The photography exhibition that preceded the movie was installed in such a way that portraits were lined up on the left side of the bridge, while the photos from the respective flats of these people were put on the right side. In Petržalka Identity Juraj Chlpík opted for a similar method: the impressions expressed by the locals are accompanied with pictures from their flats. “Cracow Guide” is Łukasz Skąpski’s video project about uptown Cracow. It consists of three parts, showing south, north and west parts of the city. A documentary video about the transformation of the interiors of prefabricated housing estates. Through interviews and research, the video documents attempts and practices to domesticate and alter radically planned spaces. The event is supported by the International Visegrad Fund.